March 31 is Cesar Chavez Day, an American commemorative day that celebrates the birth and enduring legacy of Cesar Chavez, labor movement leader and civil rights activist. Cesar Chavez (born César Chávez) was an outstanding workers' and migrants' civil rights activist. He was born on March 31, 1927 in Arizona and began his activity in 1952 as a leader of the Community Service Organization, a Latino civil rights group. Chavez founded the National Farm Workers Association in 1962, that later changed its name to United Farm Workers. He took an active part in organization of strikes for higher wages and better working conditions. His activities led to the largest farm worker strike in the history of the U.S. At the same time he gained higher wages for farm workers who were working for grape and lettuce growers. Today Cesar Chavez is a national hero and a symbolic person who fought for Mexican migrants civil rights. His birthday isn't recognized as a national holiday, although many schools, community colleges, libraries and state government offices are closed. 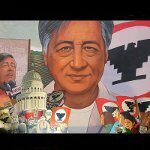 Different celebrations are held in Michigan, Arizona, Nebraska and New Mexico to honor Cesar Chavez.